Just beside Ambience Mall, The Leela Kempinski Gurgaon is located along the edge of the Gurgaon/Delhi NCR (National Capital Region) in Haryana. The hotel offers an outdoor pool, the award-winning Spa Lavanya and 4 dining options. 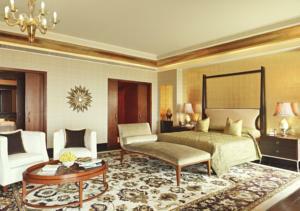 Luxurious air-conditioned guest rooms are soundproof and equipped with a flat-screen TV, DVD player and personal safe. Private bathrooms feature bathtubs and bath amenities. The Leela Kempinski Gurgaon is a 15 minute drive from Indira Gandhi International Airport and 14 miles from central Delhi. Guests can exercise at the fitness center, arrange day trips at the tour desk or get a manicure at the beauty salon. The hotel also provides car rental and babysitting services. International cuisine is served at the Spectra Restaurant. Other dining options include the Diya North Indian Restaurant. Drinks are available at the Rubicon Whiskey Bar. Rooms: Hotel Rooms: 322, Hotel Chain: Kempinski. Wired internet is available in all areas and costs INR 680 per 24 hours. Private parking is possible on site (reservation is not needed) and costs INR 91 per day. Free! All children under 12 years stay free of charge when using existing beds. Free! One child under 2 years stays free of charge in a baby beds. One older child or adult is charged INR 1813 per person per night in an extra bed. The maximum number of extra beds/baby beds in a room is 1. Any type of extra bed or crib is upon request and needs to be confirmed by management. Additional fees are not calculated automatically in the total cost and will have to be paid for separately during your stay.